An award-winning guitarist from southern California, Samuel Hines has enjoyed playing across the United States, most recently as a guest artist in festivals and concerts in North Carolina, Florida, California and Wisconsin. He obtained his Bachelor of Music from Vanguard University with Michael Nigro and a Master of Music at UW-Milwaukee with René Izquierdo. He will be pursuing his Doctor of Musical Arts this fall at the University of Minnesota, as the Teaching Assistant to Maja Radovanlija. He has also performed for many of today’s greatest artists of classical guitar, including David Russell, Manuel Barrueco, Christopher Parkening, Judicaël Perroy, SoloDuo, the Romeros, and GRAMMY award-winning Los Angeles Guitar Quartet. Praised for “Virtuosity and deep musical interpretation”, Hines maintains a busy performance schedule, recently doing a string of concerts at the East Central Regional Libraries in Minnesota. 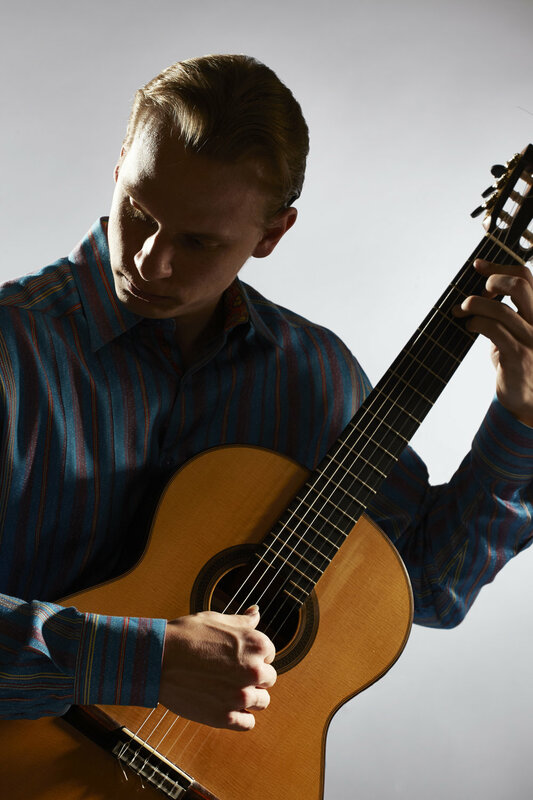 Hines is also a frequent competitor, winning prizes in over 30 competitions, throughout the United States as well as Canada, recently winning first prize at the 2017 Florida Guitar Festival, the 2017 East Carolina University Solo Guitar Festival, the 2015 Sierra Nevada International Guitar Competition, 2nd prize at the 2019 Orange County Guitar Circle Classical Guitar Competition, 2nd prize at the 2017 and 2018 Louisville Solo Artist Guitar Competition, 2nd prize at the 2015, 2016, and 2017 Wilson Center Guitar Festival, and 3rd prize at the 2015 Montreal Guitar Festival. Hines was also one of five competitors from America at the 2012 Parkening International Guitar Competition and one of two selected for the 2015 Parkening. He has also been selected in the 2019 Parkening International Guitar Competition. Hines also enjoys teaching immensely, as one of his passions is to foster appreciation of music and the joy of guitar. While in Milwaukee, Hines was the graduate teaching assistant for Rene Izquierdo, and roles included private lessons, group guitar classes, sight-reading, technique classes and leading guitar ensembles. Afterwards, Hines taught at the Academy of Performing Arts in Franklin and Oak Creek, WI, ranging from 20-30 students. Hines also taught at Maranatha Baptist University in Watertown, WI as the guitar teacher. New students are always welcome, whether in person or skype.